The Dutch cycle in massive volumes, and contrary to what you might expect, this trend is not limited to large cities like Amsterdam. In the Dutch suburbs too, the bike is a practical and well-used transport mode. It’s no fluke or product of a “love” for cycling; Just like all transportation decisions, it boils down to convenience. Imagine you’re a suburban dweller, about to head to the supermarket for your weekly shopping. How do you get there? If you live in North America, chances are that there’s really only one practical option – drive your car. If you live in the Netherlands though, the decision of how to get to the store becomes a comparison between two modes: the bike and the car. The bike or the car? If you’re an average Dutch suburbanite, chances are you have access to both. Bicycles are owned by 84% of the population, while 71% of Dutch households own at least one car. The comparison begins the moment you walk out the door. Parked right in front of the house and ready to go is your bike, sitting on its kickstand. As for the car – it’s likely down the street somewhere because in many Dutch suburbs, private driveways in front of homes do not exist. So from the moment you step outside, the bike already offers time savings over the less conveniently parked car. Not only is the bike the first thing you see when you step outside, it’s also well-prepared for utility use. There’s a sturdy rack bolted on the back and often also a basket on the front for carrying all your groceries, a wheel lock for convenient parking, and it’s designed so that you’re sitting upright when you ride, for maximum comfort. So you hop on your bike. Not unlike North American suburbs, Dutch suburban streets are windy and circuitous, intended to discourage through traffic. This adds a travel time penalty, since it takes you longer to navigate these streets to get out yourself. Dutch suburbs are just slightly different though: there’s frequent cut-through’s that can be accessed on foot or by bike only, leaving drivers as the only ones who have to take the long way. Now you’re beyond your neighbourhood street and you notice that many of the local streets are very narrow and signed for one-way traffic only – yet another travel inconvenience. The important distinction though is that this one-way restriction only applies to cars, as the vast majority of one-way streets in the Netherlands allow two-way bike traffic. Of course, the second advantage of these narrow streets is that they encourage slow driving for those who do travel by car, thereby making it more comfortable for those who are biking. By now, you’re well on your way to the supermarket. If you took the bike, you’ve travelled at a relaxed pace via a direct route of local streets and cut-throughs, while if you drove, you’ve likely taken a rather circuitous way on mostly low-speed roads. You arrive at the supermarket to find that it’s not unlike North American stores – there’s a big parking lot out front for cars, and the entrance is set back from the road – but with a couple key differences. First, the parking lot is designed for very slow travel speed, with brick surfaces and tight corners, making it near-impossible to speed. Second, immediately next to the front door are bike racks, placed in the best spot to maximize the convenience of cycling, and they’re well-used. You park your bike in this premium location and within seconds you’re inside the store. Easy! 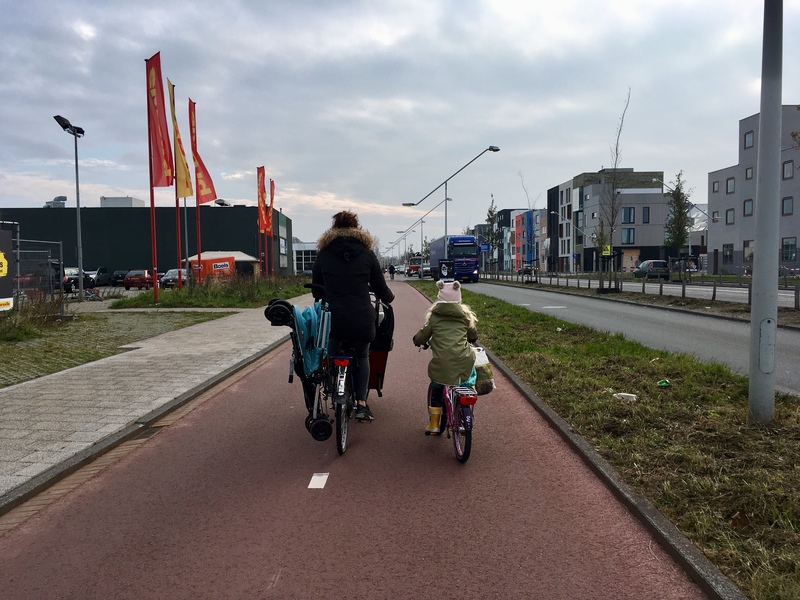 People ride bikes in the suburbs in the Netherlands not because of a love affair for bikes, but because by design, cycling is equally or more convenient than driving for local trips. The measures taken by the Dutch to advantage cycling are not complex or complicated, and could be applied just about anywhere, including North America. The bike will never replace the car, nor should it. But we should think practically about where this sustainable mode of transportation can be best used, and similarly where the car might not be the best solution. Those are urban neighborhoods, not suburbs.